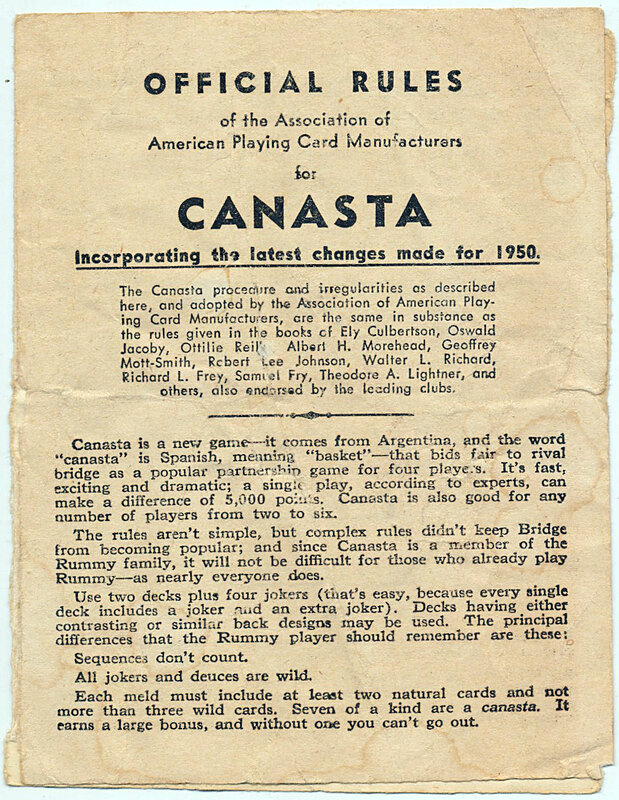 Canasta is a card game of the Rummy family which is believed to have been invented in the old Jockey Club of Montevideo, Uruguay, in 1947. 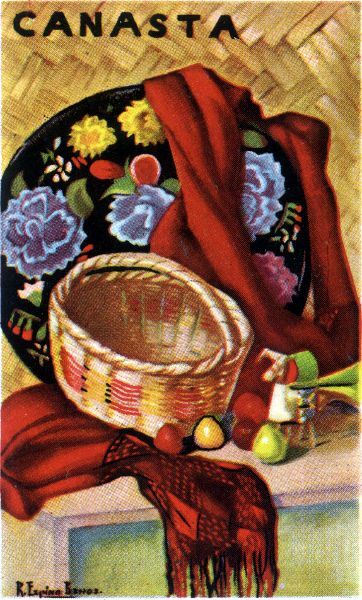 By 1948 it was exceedingly popular in the fashionable clubs of Argentina and from there it spread to the rest of South America. 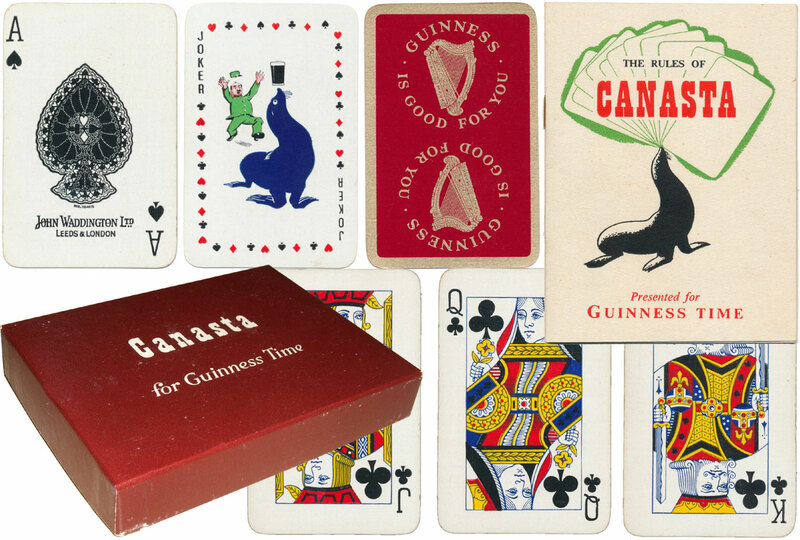 In 1949 it was introduced into the USA where it quickly became the most popular card game before being knocked off the top place by contract bridge. 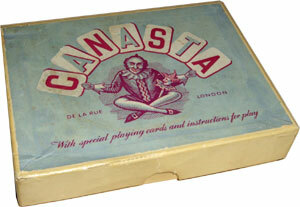 The word “Canasta” is Spanish, meaning “basket”. 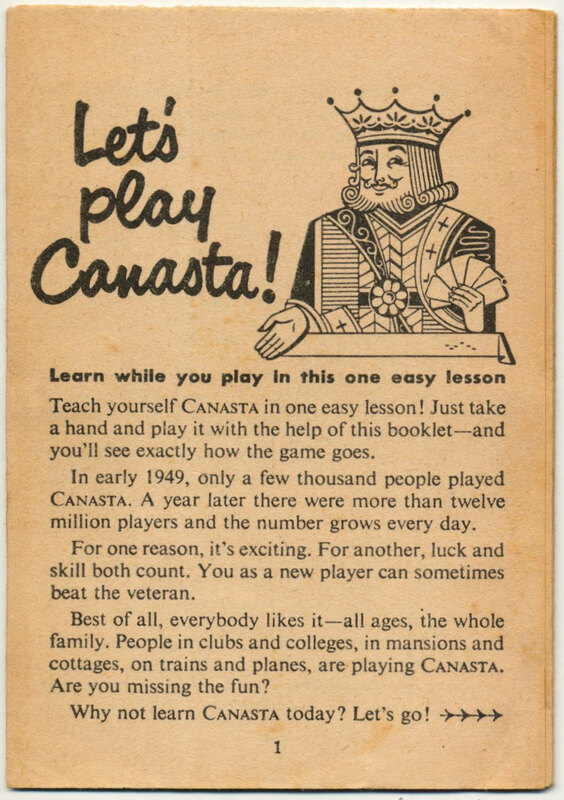 Canasta is best played by four players forming two partnerships using two identical decks each of 52 cards plus two jokers (which are wild cards, hence they sometimes carrying the legend ‘wild’ rather than ‘joker’ in Canasta decks), totalling 108 cards. 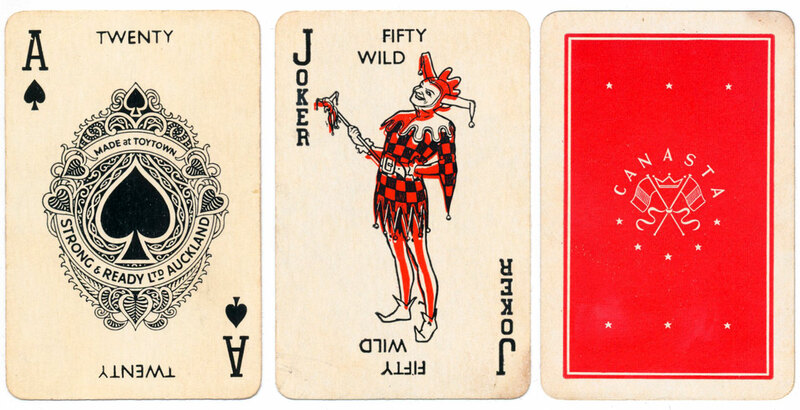 It is for this reason that manufacturers commenced adding two jokers to packs of playing cards, rather than just one, in around 1950. 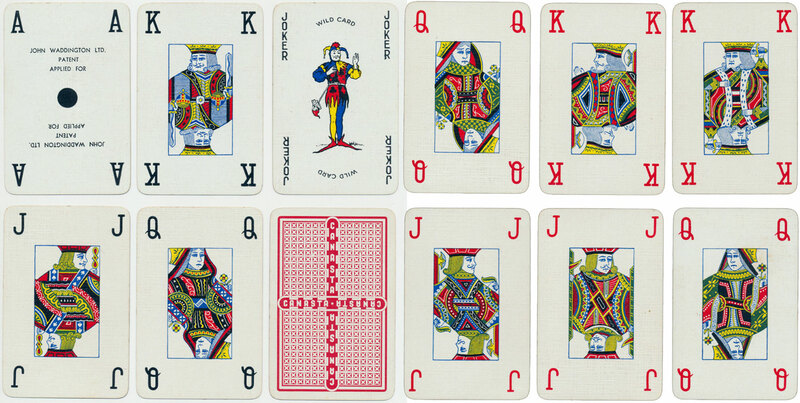 Unusually, only two suits are recognised in Canasta - red and black, and different denominations of cards score differently. 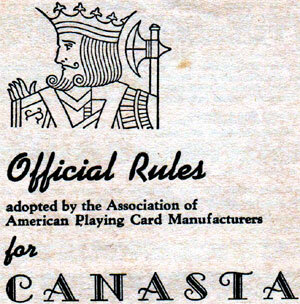 This has led to the production of custom Canasta cards, without suit signs, and ordinary decks with scores printed on the cards. 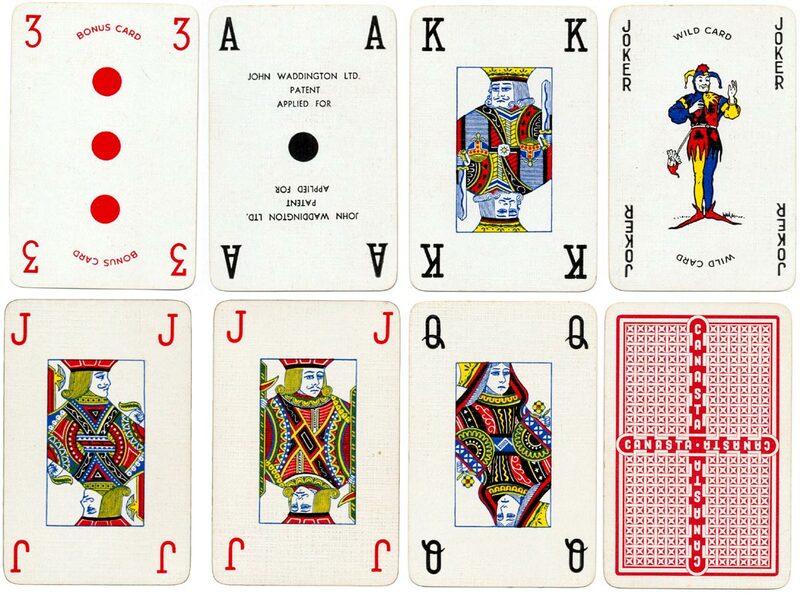 Custom dual decks of cards, not dissimilar to those produced for bridge, but with the same back-design and colour have also been marketed by among others the US Playing Card Company, Waddington’s, De La Rue and Piatnik. 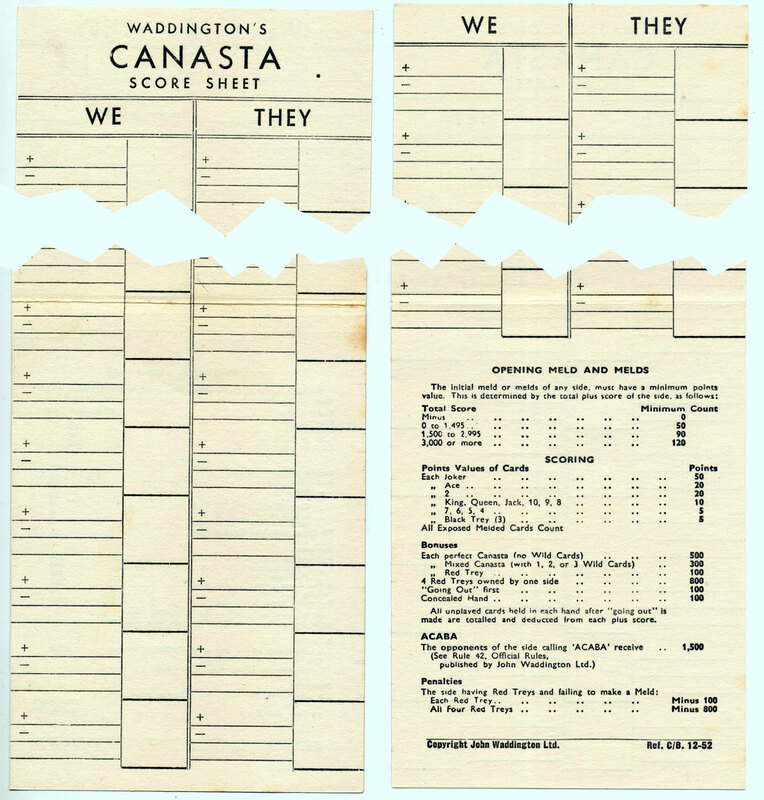 Above: Waddington’s “Real Canasta” custom playing cards without suit signs but no point values printed on the cards, 1952. 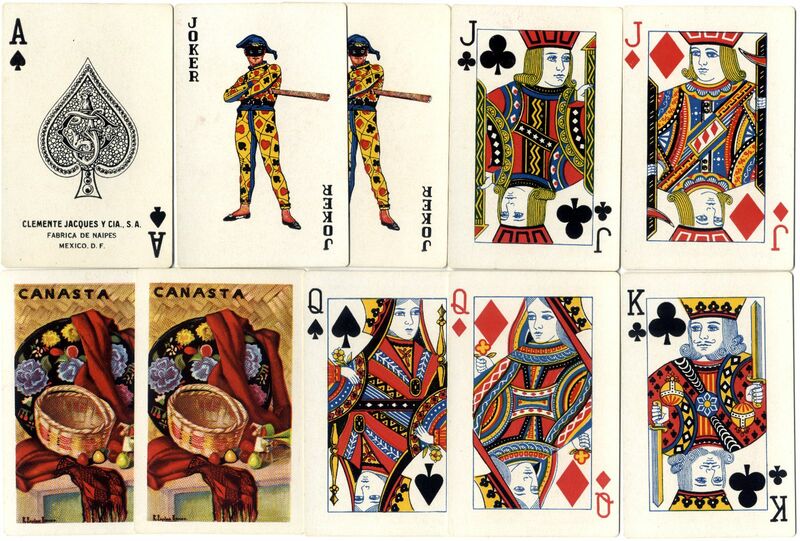 Above: Canasta cards manufactured in Australia by the Valentine Group with a Mexican style Joker and value points marked on the cards. Image courtesy Ken Lodge. 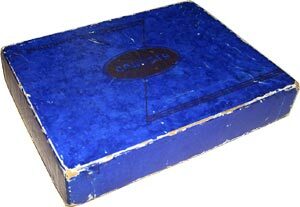 Above 3rd grade quality Naipes Side Car manufactured by Luis A. Fourvel y Cía, Buenos Aires, c.1948, with a reference to ‘Canasta’ on the box. 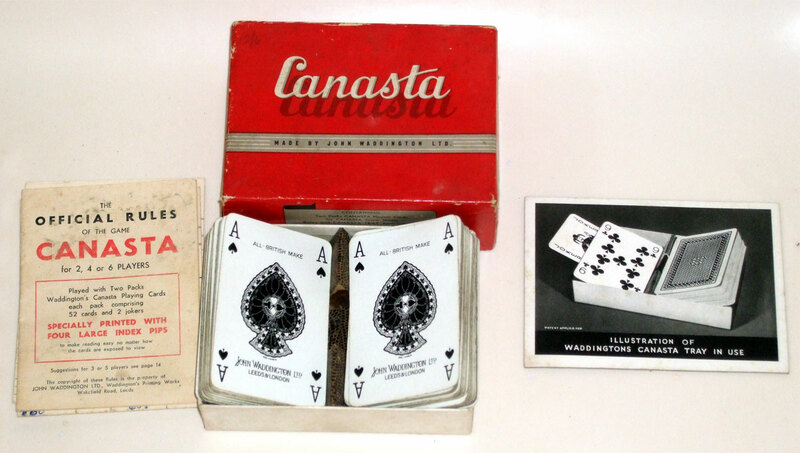 Above Guinness promotion Canasta set by Waddingtons, c.1951. 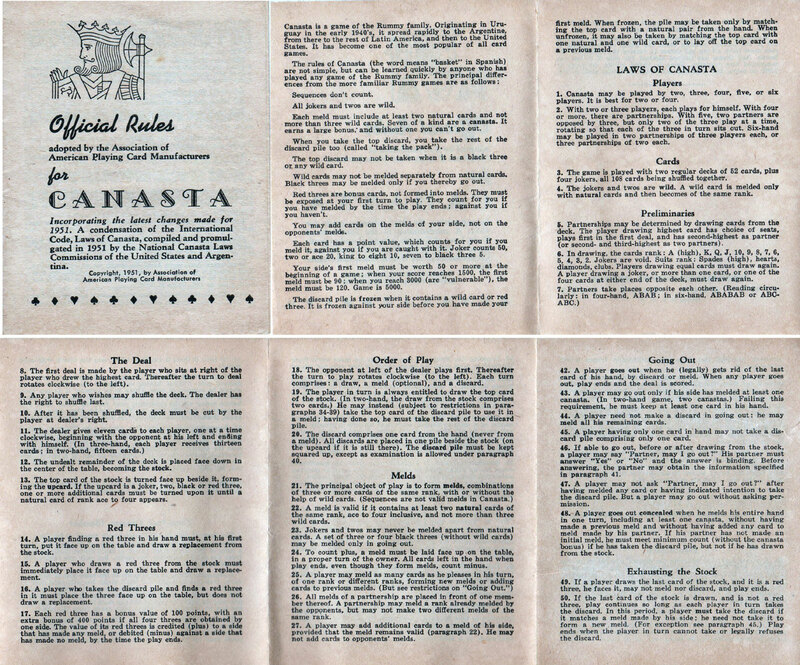 The standard Canasta set has been rebadged for Guinness - the rules booklet has a different cover but is the same inside (click image to zoom). 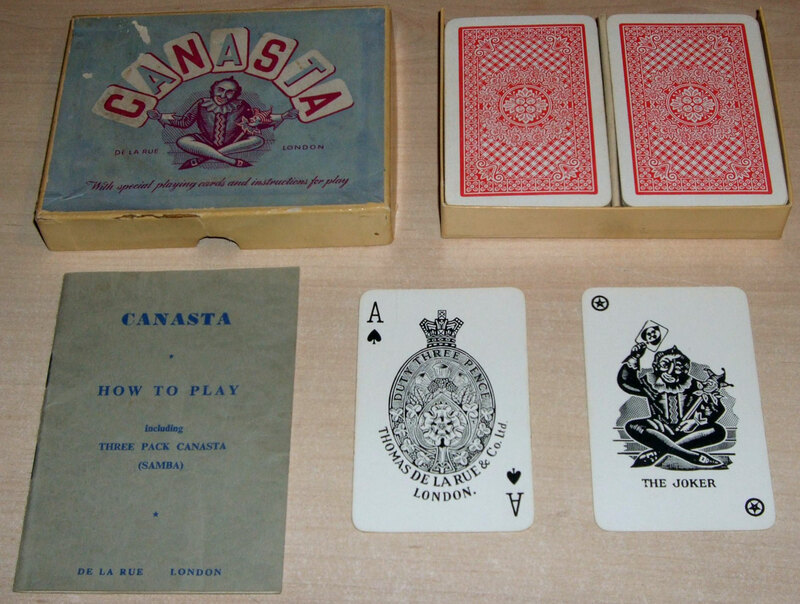 Variations of Canasta include three-deck Canasta, using three identical decks of 52 cards plus six jokers and Samba which also uses three decks and six jokers. 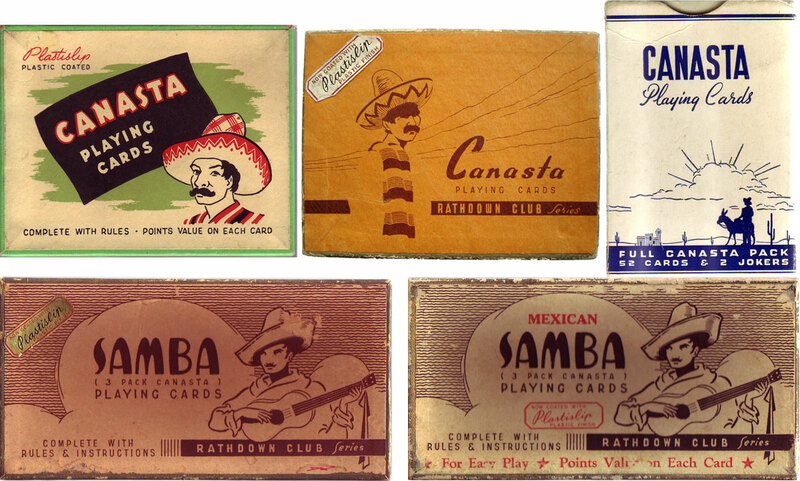 Above: assorted boxes for ‘Canasta’ and ‘Samba’, another variation on the Canasta theme, with romantic touristic Mexican imagery, produced in Australia by Hudson Industries Pty Ltd. Images courtesy John Daniels. 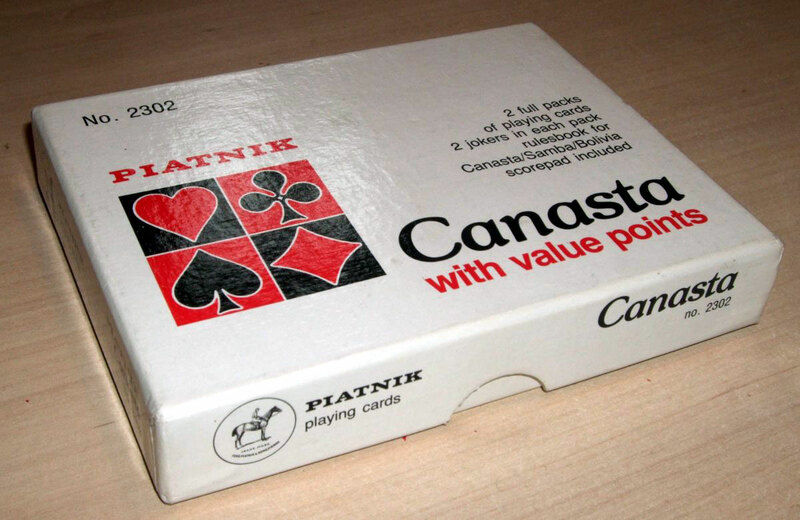 Above: Canasta No.2302 set manufactured in Austria with value points marked on the cards, c.1990. 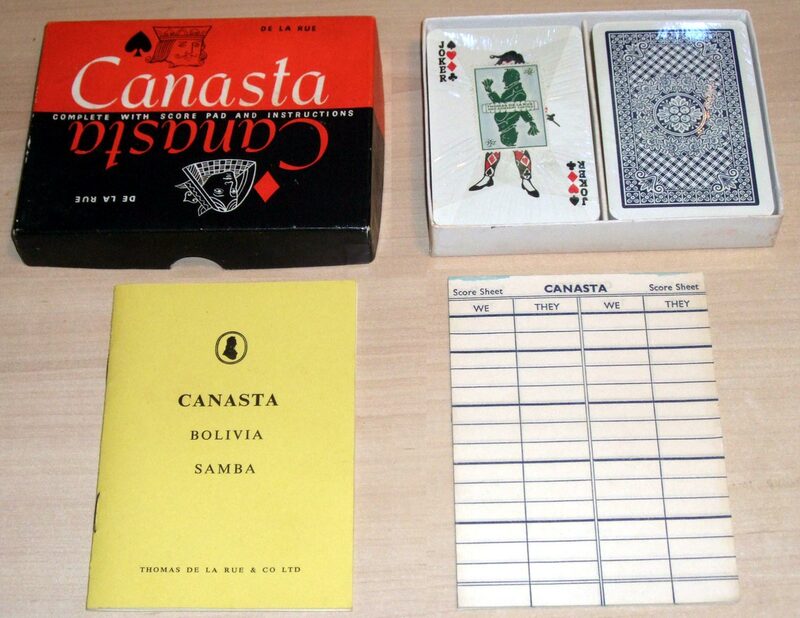 Acknowledgements: thanks to Matt Probert for research and images (unless noted otherwise) and to Cristina Lia Broquen for notes about the Uruguayan origin of the game Canasta. 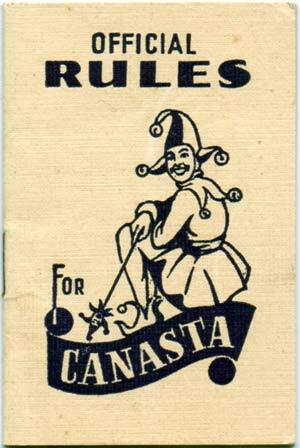 Above: USPCC Congress “Canasta” leaflet, c.1950. 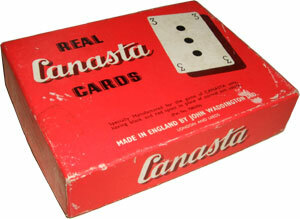 Above: USPCC Congress “Canasta” set, 1950. 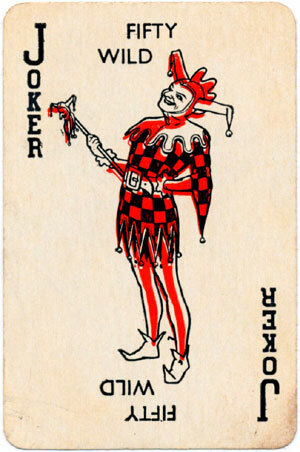 The set comprises two identical decks, both with two jokers, plus a rules leaflet. 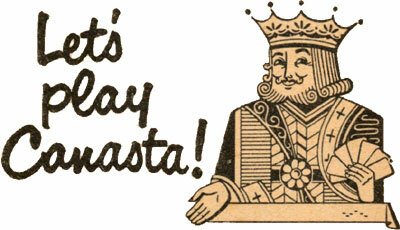 The cards are gilt edged and of super smooth feel and quality. 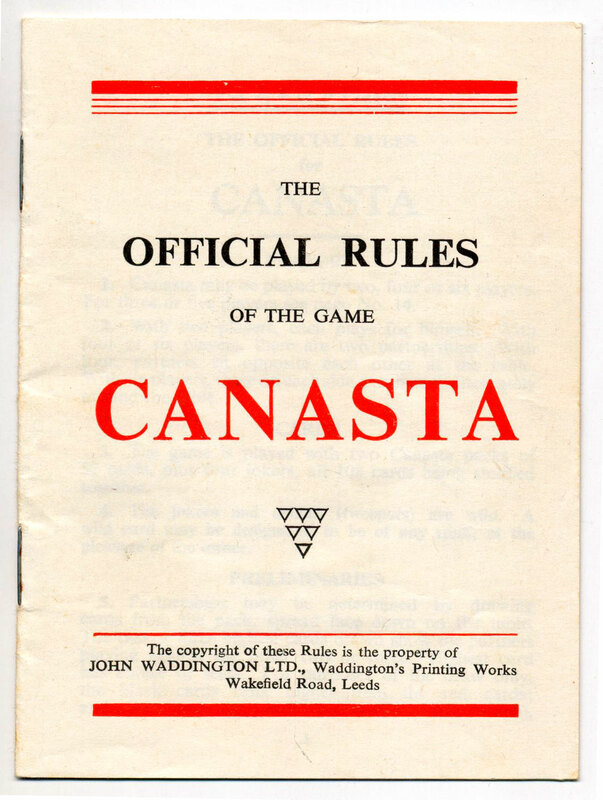 Above: Official Rules booklet for “Canasta” arranged by Albert H. Morehead, printed by Alf Cooke Ltd, Leeds & London [no date]. 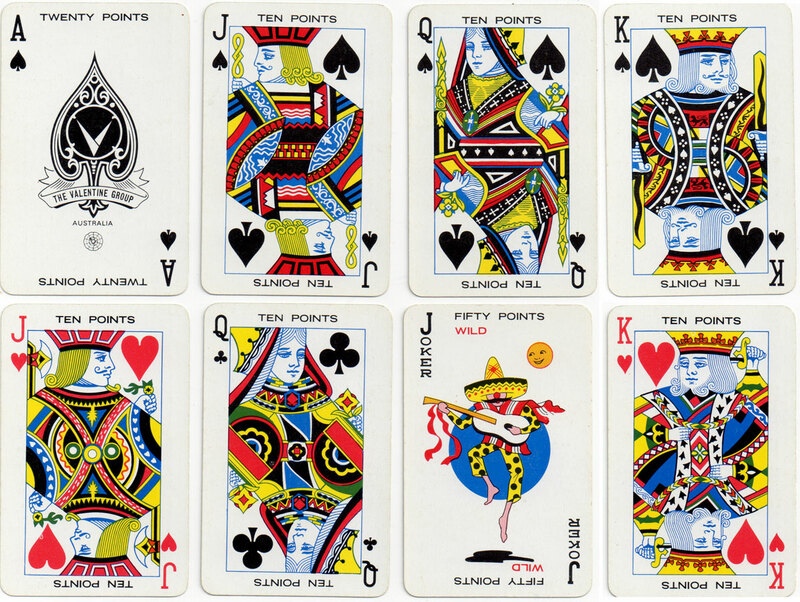 Above: Canasta Joker by Strong & Ready Ltd, Auckland, New Zealand. 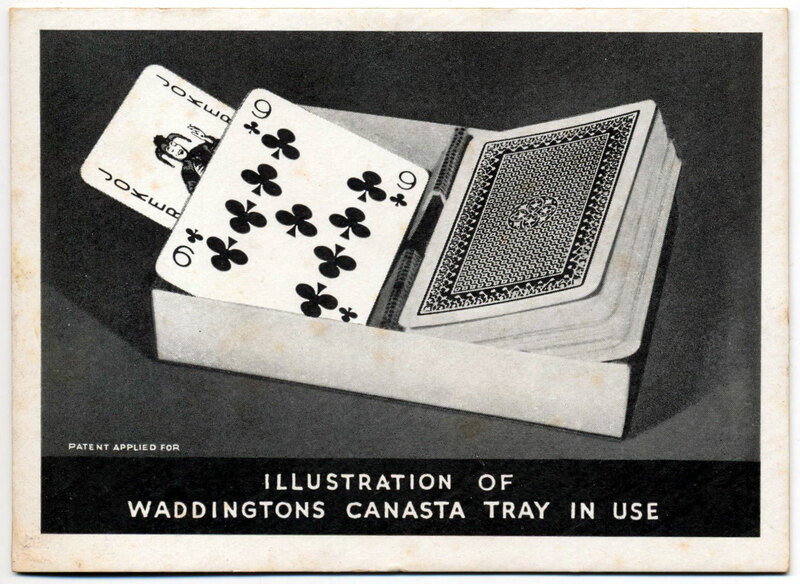 Above: Waddington’s “Canasta” set containing the official rules booklet and a Canasta Tray, c.1950. 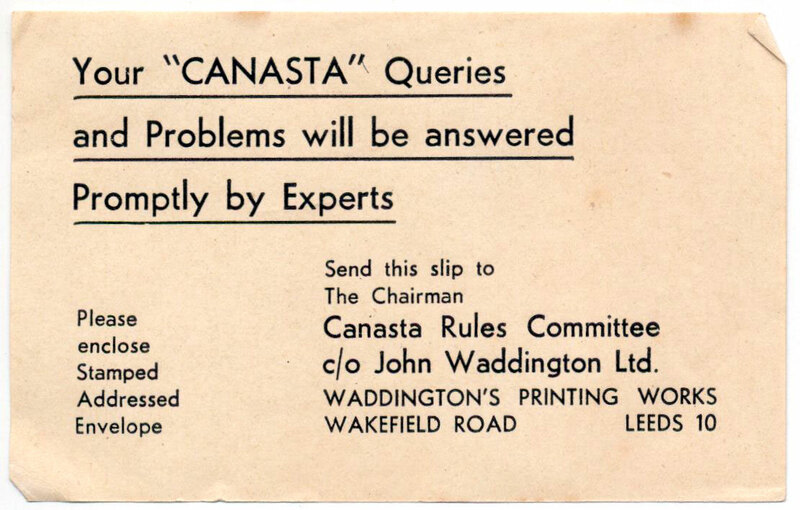 Above: Waddington's “Canasta” set with a rules booklet (a code on the rear page suggests 1950) and a slip offering a help service by the Canasta Rules Committee. 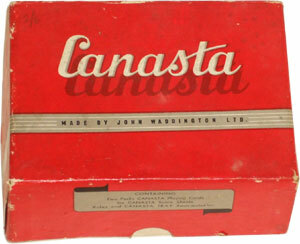 Above: Waddington’s “Real Canasta” set, patented by Cobianchi in February 1951, the patent being granted in January 1952, also includes an official rules booklet and score sheet, 1952. 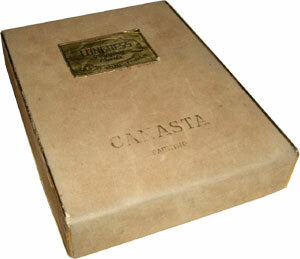 Above: De la Rue boxed “Canasta” set, c.1950. 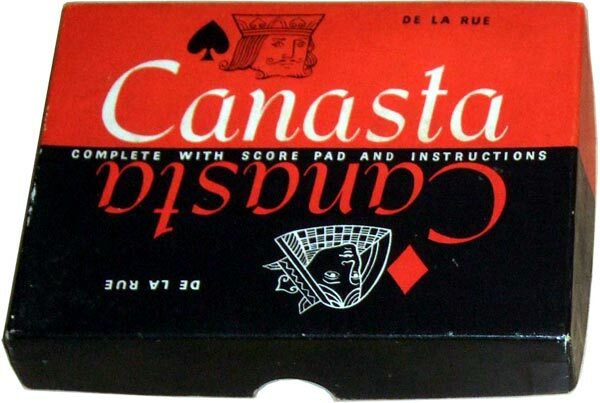 Above: De la Rue boxed “Canasta” set, c.1962. 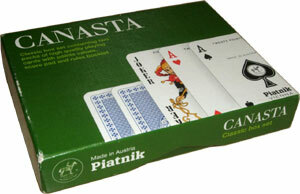 Above: Piatnik “Canasta” set, 1990s or later.